There are a few different types of comedy shows, but two are the most popular. One builds a general form of goodwill, a bunch of likable or at least charming characters interacting with each other. It’s warm and inviting. The other tends to aim for laughter, going for surprise, which often works better with less pleasant characters. At the top of the form currently, the former includes Parks & Recreation, the latter, Community, although there’s a lot of overlap. The typical American Dad episode (or Seth MacFarlane show generally) tends to string together a series of set pieces, vaguely connected by an overarching plot, but with the primary goal of forcing laughter from individual moments. Family Guy usually used to experiment with different forms of humor, but those tend to be difficult sells, like the class bully suddenly deciding to be nice to you for no apparent reason. It stands to reason that American Dad, being a generally better show than Family Guy, can pull off the tonal switch better than the other show. That’s the case here, as American Dad switches from being a shock comedy to a hangout comedy. Steve and Roger start a detective agency – it’s fake, but the cases are real – which the entire episode buys into. Sure, they acknowledge the artificiality of it, but it is essentially a half-hour of Steve and Roger playing make-believe. Since they’re detectives, the story goes noir, but the stakes are always fairly low. Stan, who has a three-day weekend, joins in, but he’s terrible at it. Can’t exactly tell if he’s trying to hard to be incompetent, or actually simply being incompetent, but either way, he disrupts the simple comfort that Roger and Steve have in their make-believe. But Steve can’t fire him, because Steve is a softy, so he sends Stan on a fool’s errand, until Stan gets kidnapped. It’s not a recipe for big laughs, but it is generally pleasant to hang out with the characters, and their personas, Wheels and the Legman. 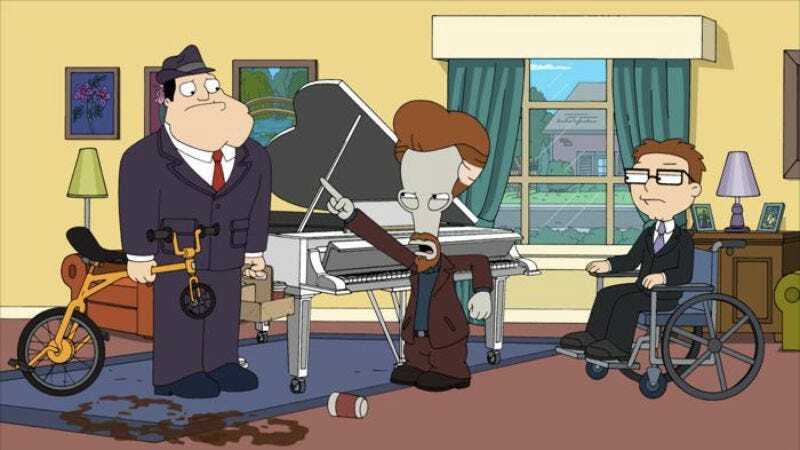 Roger’s “Legman” has the best bit of the show, when his morning routine is depicted. He wakes up to “A Fifth Of Beethoven”, does his exercises, pours his coffee, then pretends to drive to work. It’s actually fairly effective character work, at the same time as being legitimately funny. There’s a b-plot involving Francine and Haylee trying to get Klaus on Cutepetpics.com, but it’s less successful. The show pretty much forgets about it, just as most of the viewers did. But what it does do is situate this episode as a straightforward sitcom. This could be done live-action, without many major changes at all. “Pleasant” and “charming” and “low-key” and “playful” aren’t normally terms I’d associate with American Dad. But when it uses those as goals, apparently it succeeds admirably. Sure, I wish the episode was funnier, but sometimes pleasant is just as good as funny.